YOKOSUKA, Japan - Secretary of the Navy Richard V. Spencer inducted U.S. Sen. John S. McCain III into the official namesake of the guided-missile destroyer USS John S. McCain (DDG 56) in a ceremony on board, July 12. 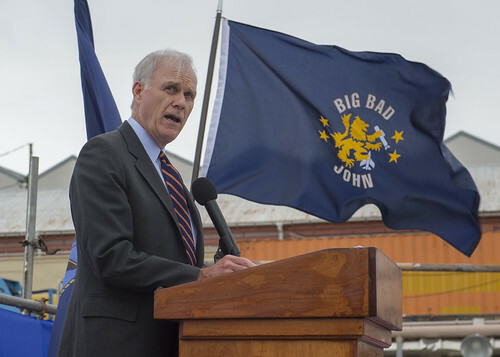 Commissioned in 1994, the destroyer already bears the names of Sen. McCain’s father, Adm. John S. McCain, Jr., a former U.S. Pacific Command commander, and his grandfather, Adm. John S. McCain, a distinguished World War II carrier task force commander. Sen. John S. McCain, III, continued this proud legacy as a naval aviator during the Vietnam War. As a prisoner of war, he endured more than five years of captivity, representing America honorably and selflessly. The destroyer is the second ship named John S. McCain. A new SECNAV naming notice officially honors three generations of dedicated service to the Navy and nation. “Today, we add the story of Sen. John S. McCain to the spirit of the mighty vessel which already carries the legacy of his father and grandfather,” said Spencer. “As a warrior and a statesman who has always put country first, Sen. John McCain never asked for this honor, and he would never seek it. But we would be remiss if we did not etch his name alongside his illustrious forebears, because this country would not be the same were it not for the courageous service of all three of these great men." After retiring from the Navy, Sen. McCain continued national service in Congress, first as a Representative and later as a Senator from Arizona to this day. He took an active interest in the destroyer and its crew, visiting them most recently during a port visit to Cam Ranh International Port in Vietnam on June 2, 2017. The ship had visited ports in Vietnam several times before over the years in honor of the McCain legacy. 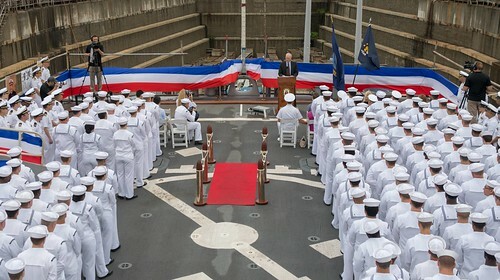 "After SECNAV’s remarks, the crew and guests observed colors," added Cmdr. Micah Murphy, McCain's commanding officer. "The flag we flew today, as well as the commissioning pennant that flew during Sen. McCain's visit in Vietnam last year, will be given to him to commemorate this historic occasion." USS John S. McCain is forward-deployed to Yokosuka, Japan as part of the U.S. Seventh Fleet.